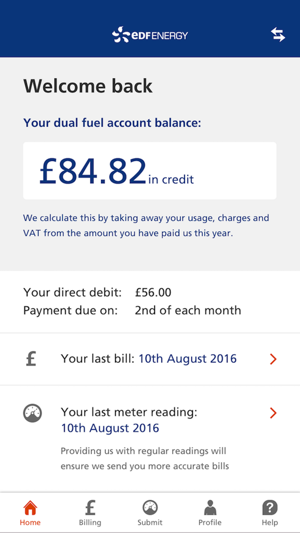 The EDF Energy app makes it easier to manage your energy account on the go. • Log in using the same details as your online home or business account – so there’s no need to remember multiple passwords, with the ‘remember me’ functionality. 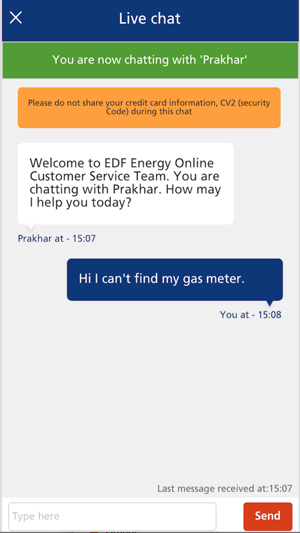 • Live Chat – get immediate answers to your questions from an EDF Energy advisor 24/7. • Give us meter readings – so you only pay for what you use. • View detailed account information including your account balance, your Direct Debit (including requests to increase or decrease), your last prepayment top-up and your tariff details. • Our latest Blue+Price Promise tariff comes with the reassurance of always being able to check you wouldn’t be better off elsewhere via the EDF Energy app. • Check the progress of your switch to EDF Energy if you just joined us. 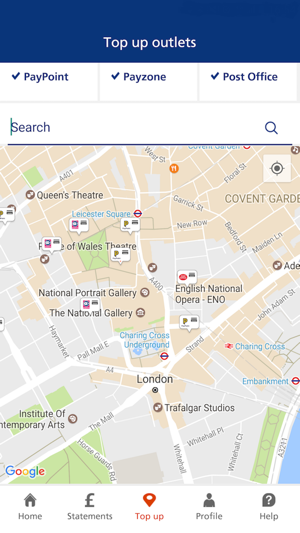 • Find your nearest prepayment outlets (PayPoint, Payzone and Post Office) and see which facilities are offered along with opening times. Request a replacement prepayment key or card if you’ve lost or damaged your current one. Huge company yet such a poor app! Honestly you would think that (and this is just me considering my own monthly bill amount...) a company as big as EDF would invest a bit more time and money into their app, since the point of these apps is to ‘make our lives as customers easier’ and this app does the complete opposite! My biggest issues occur as soon as i open the app, firstly it constantly asks me to scan my bill or skip, i skip then it asks for log in details... password and asks if you want the app to remember your details... i have ticked it EVERY SINGLE TIME! & yet every time i re-load the app or my screen times out it goes straight back to the ‘scan your bill page’ and NEVER remembers my details but yet if i sign in through webpage my iPhone doesn’t ever fail to do as it should and auto input my details! I have been with EDF over 4 years and the app used to work perfectly fine and it did as it was intended for probs 2 years. EDF’s user and customer experience is so pitiful and embarrassing it’s like you’re in a parallel universe. I asked a customer advisor today, in the chat feature of the app, why does the app tell me their is a network error when I want to view my Bill’s. Her response was that it’s normal, it means the bill needs to be generated. Wait, what? A network error = bill being generated? I am shocked that a company would even release something that a 12 year old could build in their bedroom. This is basically telling the world: I am EDF and I don’t care how I look. Shameful. What is shocking is that app has literally not changed or even updated in 2 years since I have been on a fixed tariff. Pitiful. I will not get into their overall customer experience. I have since moved to another provider. Advice to EDF: Remove this app from the store asap. This is embarrassing. + Customer service tells me this: the reason you get a ‘network error’ message is because your bill has not been generated. This is so laughable I rest my case. I have just transferred from Avro energy for a better dual fuel rate. First impressions are not good though. 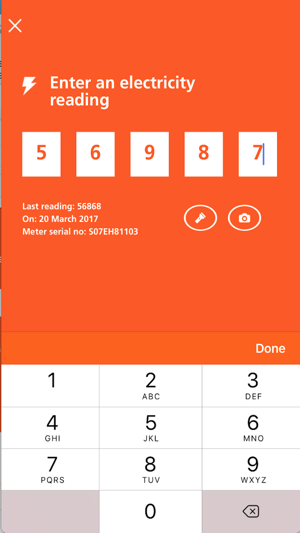 I downloaded the app to make it easier to give my first meter readings. Initial problems with the app - it is constantly freezing and closing while in use - I need to type in my email address and passwords again each time, no access to saved passwords or email addresses. It wouldn’t even let me paste in the password when copied - no success in giving meter readings on the app due to it crashing each time I tried. I logged into my account on my pc to do this instead. Again it wouldn’t let me add meter readings there. Had to start a chat to get this done. I’m told this has been updated now but it’s not showing on my account. First impressions not good at all. Avro, which is a much smaller company, wins hands down.